The Guardian reported at 15:57 EST that Israel and Hamas have agreed to end eight days of conflict between the two groups in the Gaza Strip. The conflict has claimed more than 160 lives, three of whom were Israelis. For further details on the ceasefire, click here. On her trip to the Middle East this Thanksgiving week, U.S. Secretary of State Hillary Clinton flew to Tel Aviv, Israel, to meet, first, with Israeli Prime Minister Benjamin Netanyahu. After this stop, the Secretary traveled to Cairo, Egypt, where Egyptian President Mohamed Morsi is attempting to negotiate a ceasefire to Israel’s “Pillar of Cloud” assault on Gaza’s population. Of course, her first stop would be to set up a photo op with the leader of her government’s “best friend” in the Middle East. A central premise of US media coverage of the Israeli attack on Gaza – beyond the claim that Israel is justifiably “defending itself” – is that this is some endless conflict between two foreign entitles, and Americans can simply sit by helplessly and lament the tragedy of it all. The reality is precisely the opposite: Israeli aggression is possible only because of direct, affirmative, unstinting US diplomatic, financial and military support for Israel and everything it does. . . . .Pretending that the US – and the Obama administration – bear no responsibility for what is taking place is sheer self-delusion, total fiction. It has long been the case that the central enabling fact in Israeli lawlessness and aggression is blind US support, and that continues, more than ever, to be the case under the presidency of the 2009 Nobel Peace Prize winner. Hillary Clinton flew into a cauldron of death and destruction which the U.S. enabled to take place. She is expected to play a role in bringing an end to this latest development in American Middle East policy. Senior Egyptian officials in Cairo said Israel and Hamas were “very close” to a cease-fire agreement. “We have not received final approval, but I hope to receive it any moment,” said Essam el-Haddad, President Mohamed Morsi’s top foreign affairs adviser. Khaled Meshal, the Hamas leader, said in Cairo that Israel needed to end its blockade of Gaza. Israel says the blockade keeps arms from entering the coastal strip. Israel’s rationale for the blockade, of course, is a subterfuge which convinces no one but an American public lulled by a pro-Israel media, and a bought and paid for political leadership, into believing the blockade is a purely defensive measure. The truth is that the blockade is one of Israel’s many forms of mass torture of the Palestinian population held down by a brutal military occupation. Hillary Clinton would not be in the Middle East if she, and President Obama, did not have some assurance from Hamas and Israel that a “ceasefire” would be arranged. The Secretary plans to retire in January, 2013. A failure to halt this current murderous assault from Israel soon, would not be the way she would want to end her diplomatic career. Clinton and President Obama are sinking considerable political capital into their effort to halt the Israeli assault. Their efforts are badly handicapped by the burden of untruth they carry which pretends that the “conflict” between Israel and Gaza is a battle between equals. It is not. It is, rather, a struggle between jailer and prisoner, with all the power, except that of morally justified protest, is on the jailer’s side. Outside the English-speaking nations of the U.S., Canada and Britain, support for Israel is evaporating rapidly with each new demonstration of immoral national conduct. As a notable example, Turkey’s Prime Minister Recep Tayyip Erdogan spoke in Cairo last week and harshly condemned Israel. Little of this perspective is seen or heard in main stream U.S. media, but alternative media outlets are growing in number and influence. CounterPunch was up this week with an eloquent and sobering essay by Jennifer Lowerstein, a faculty associate in Middle East Studies at the University of Wisconsin-Madison. Her essay, Death in Gaza, Deja-Vu, includes a description of the impact of the Gaza assault. All the sounds and sights and smells of slaughter verify the damage and danger of aerial assaults and targeted killings; apartment buildings still buzzing with human activity when missiles pierced through their ceilings offer up their dead and wounded to the deafening skies. Progressive US President Barak Obama and his allies applaud Israel’s masterful techniques of preventive war as self-defense; its sophistication at using state of the art weaponry against mosques, homes, markets and schools; re-emphasize at press conferences the right of Israel to defend itself against the human cattle they have justly corralled into densely packed camps to be bound and slaughtered or starved and transferred elsewhere. The alternative media web site, Mondoweiss, provided its viewers with a valuable example of one journalist, Associated Press Washington correspondent, Matthew Lee, who challenged the conventional pro-Israel perspective of Washington’s policy shapers. A central tenet of Israeli military policy is “deterrence.” This is embodied in the so-called “Dahiya Doctrine,” which dictates the use of overwhelming and disproportionate firepower and the targeting of government and civilian infrastructure during military operations. It received its name from the Dahiya neighborhood of Beirut, a stronghold of Hezbollah, which Israel destroyed almost completely during its assault on Lebanon in the summer of 2006. It stated:’ With an outbreak of hostilities [with Hezbollah], the IDF will need to act immediately, decisively, and with force that is disproportionate to the enemy’s actions and the threat it poses. Such a response aims at inflicting damage and meting out punishment to an extent that will demand long and expensive reconstruction processes. The Dahiya Doctrine was developed by Israel to maintain its control of the Middle East, which it likes to describe as a “dangerous neighborhood”. This is the doctrine which Barack Obama embraces when he allows Israel to carry out a military attack which violates international laws and which is, at its core, immoral. It is this policy which President Obama endorsed when he sent Hillary Clinton to the region to help broker an end to the slaughter. We can only hope that she and leaders in the region will find a ceasefire solution. To the essential question, what next, one thing cries out as an essential part of how this country should move forward. When President Obama returns from his Asia trip, he must reflect on how much of the blame for the Gaza assault rests with him and his willingness to allow Benjamin Netanyahu to carry Israel, and the U.S. as a major enabler, into an ugly, brutal and immoral assault on a civilian population. Barack Obama has a new four-year term before him. He will not run again for public office. In that sense, he is a free man. Now is the time for him to be the courageous and moral leader he must surely want to be, and his public wants him to be. To do this, he must take control of U.S. foreign policy away from both the Israel Lobby, and another Israel-enabler, the military-industrial complex that President Eisenhower warned us against. The Gaza assault, the second against Gaza in four years, is an immoral act that must not be repeated. 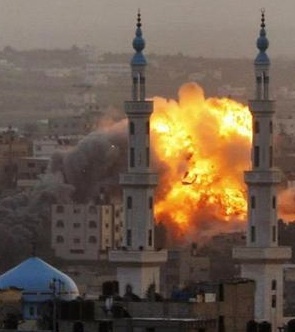 The picture at the top of the page of a bomb strike in Gaza City, is from Mondoweiss. It was taken by Marah Elwadia. This entry was posted in Hillary Clinton, Middle East Politics, Netanyahu, Obama. Bookmark the permalink. Jim, this is a great post, as always. I beg to differ. Obama boldly played his “free man” card last week. That was the time to be courageous. Now he sends Hilary to take credit for that which was achieved despite himself. I was talking to a friend in Gaza yesterday. “Maybe the American public doesn’t know, but the leaders know, they know.” With the opportunity before him to at least say nothing, Obama wasted not a minute to encourage Israel to escalate under the subterfuge of self-defence. Israel is now slaughtering children with drones, a tactic invented by Dronebama himself. He is no less cynical than his predecessor. All I want to say is for people to take action. Write and call President Obama (writing on his whitehouse contact site is better because you can get through). Call your congressional Reps. Demand an immediate cease fire, the end of the five year old blockade of Gaza, and the end of illegal settlements and daily human rights abuses of Palestinians that they have endured for decades. Call out your newspapers with their censorship, bias and propaganda they they usually dish out on this issue. Send them a few genuine facts. Only an aroused and active citizenry can do something to stop US support of Israeli crimes, committed with our tax dollars. Yes, I and my friends at KUSA and I/PMN, And End the Occupation, and JVP, are now doing all we can to support BDS, start building a “growing groundswell” against the OCCUPATION, boycott products coming out of I. Divest in companies profiting from the Occupation, and hoping and working for the day when the US government will start sanctions (withholding the $3b) from I’s immoral actions. This is madness. We need another visitation by the Master, who went to Gentile territory and confronted Legion, the Mob, the madman, who gave in to every whim, thinking it was freedom, and finding perfect slavery. Jesus, bring sanity, please, to this warring madness! That Victoria Nuland is at the State Department podium at all speaks volumes about the ideological inter-connection between the Obama-Hillary Clinton axis and the Zionist-Neoconservative faction. For amplication on this unholy alliance, “google” Victoria Nuland, her husband Robert Kagan and her brother-in-law Frederick Kagan, as well as the family’s intimate relationship to the neo-conservative movement. Your research efforts will provide some interesting insight into why our Nobel Laureate leader has been proving himself such an avid friend of tyranny. A superb essay indeed. Sadly, most underestimate the Israeli stranglehold; The suggestion by Fred to write to politicians and the biased media will only fall on deaf ears. I think it will take a miracle to overcome the obstacles created by the myths and lies disseminated by the mainstream media since 1904! Once again you’re prescient, Jim. Unfortunately, the suddenly free “Obama” for whom many of us voted and pinned new hope four years ago as well as a few weeks ago, will let us down again. He is not as free as we think he is, or better yet, he will not do anything with his freedom, now captive of a legacy. I applaud your article, Jim, and agree completely. We, the US, are the enablers of a conflict where we reward those who profit by the conflict, and the Palestinians are the ones who have, who will suffer. I’ve passed the article on to my e-network, Jim. Continue your strong, courageous, and prophetic work. Also, for those reading the response, look at the most recent open letters by Mark Braverman of Kairos USA, as well as Rev. Geoffrey Black, General Minister and President of the United Church of Christ. – both in the same vein. Thank you again, Jim. it cannot be declared often enough nor vehemently enough….this wretch of a “diplomatic spokesperson for State Dept” is part and parcel of the NeoCon infestation of the American govt which slithered in on the coat tails of GWBush’s claim of “a humble foreign policy” & then immediately began to push for war (any Arab state would do for starters)…following NULAND’s pork roast hubby Robert Kagan, FOUNDER of PNAC …It must be driven home again and again.as long as.they remain in the US govt they warrant purging for betraying the Constitution and every moral humane and just law that was ever written…for their crimes against humanity and their partnership with the Netanyahus/Liebermans/and the other tyrants in their machiavellian coven. Jim, Many thanks for a powerful analysis. You hit the nail on the head on several fronts. 1- Israeli occupation of Palestine is an “existential threat” to the Palestinian Nation, and not vice-versa. By occupying Palestine, strangulating Gaza, building settlements and an Apartheid Wall, conducting pogroms and ethnic cleansing, Israel is a “Permanent War-Crime Machine” that mows down Palestinians at will. 2- How can anyone blame Palestinians for defending themselves against a “permanent” daily occupation? What countries or nations will accept that? Israeli occupation of Palestine is an “on-going” illegal, criminal act of aggression, while every act of resistance to this aggression is a “retaliatory” act, supported by the most basic laws of humanity. 3- Israel has NOT and does NOT recognize Palestine. By contrast The Palestinian Authority, which represents Palestine, recognizes Israel. Israel has no right to blame Hamas for refusing to recognize Israel before Israel recognizes Palestine. It should be done simultaneously. 4- Israel’s building of settlements and importation of 600,000 illegal settlers in the West Bank and East Jerusalem, while feigning peace talks, has dissolved the 2-state solution in pure colonial acid. Israel has enforced a One-State solution. 5- The US is not an innocent bystander. It has supported and preserved Israeli occupation of Palestine in 1948 and in 1967, and ever since. The least that both countries can do is to ensure a solution in the same manner they ensured the dispossession of the Palestinian people and the occupation of their land. Jim, your columns are always very helpful. In 1947 the United States was one of several nations who divided up the British Mandate in the Middle East and placed a group of Europeans to live in a certain portion. The US consciously or otherwise have the obligation to support their very grievous decision. Until the US Government is forced to face the fact that it superimposed another people on the local population of another country I see a continuation of much the same. I disagree. Hamas fired hundreds of missiles at Israel; Israel dropped hundreds of bombs on Gaza. Can’t get more proportional than that. The only reason more Gazan’s were killed is because Israel has Iron Dome. Everyone of those rockets from Gaza had the potential to kill and if not for Iron Dome many Israelis would have been killed. I’m wondering what Mr Wall would consider a propertional response – Hamas gets to fire rockets on Israeli cities at will and the Israelis are forbidden to respond – is that your proportionality? It is a known fact that rockets fired from Gaza are always in retalliation to an Israeli provocation as is the case in the most recent instance where Israel had killed a Hamas leader. Another known fact is that the controlled media never reports the provocation that precede any rocket attack. Besides these so-called rockets are primitive home-made devices and are virtually nowhere near as effective as the most sophisticated weaponry in Israel’s arsenal. The Israelis have pounded a defenceless civilian population in a concentration camp using their air force and navy. Had the Palestinians been in possession of any real deterrence capability, Israel wouldn’t have provoked them. Iran does not manufacter primitive home made devices. You remind me of the Republicans in the last election – living in the echo chamber; only hearing the voices of the like minded. It is not a fact that rockets are always in retaliation for an Israeli provocation. Both sides provoke when they see it in their interests to provoke – Hamas has done as much as Israel in this regard. Let me propose that you live under the threat of those rockets. I doubt you would be so cavalier about their potency. The fact that israel is better prepared to protect its civilians through Irone Dome and air raid shelters does not mean they have to sit their and take it. Would you be happier if one of the rockets struck a building and killed dozens of people – would that satisfy your “proportionality”. I suggest you read the following article (URL below) from the Lebanese journal “Now Lebanon” – if you can risk emerging from your idealogical cocoon. OCCUPATION, by its own definition, is a criminal aggression, the ultimate war crime, running against the UN Geneva Convention and the most basic tenets of the UN. Would anyone, or any party in the USA, consider consider for a minute finding another reason to ignite the struggle against a power that conquers any of its lands? The Palestinian people are no different. Palestinian leadership needs no other reason than “Israeli occupation” itself to fight for their very own existance, freedom, and independence. No other reasons, whatsoever, are needed. Period. I am truly puzzled by your comment. You have no idea that Gaza is a large concentration camp with all border, air land and sea, sealed. Therefore, Iran cannot supply “rockets” to Gaza. The so-called rockets are home-made by Gazans and nothing more sophisticated than fireworks. To say that the Palestinians provoke Israel is tantamount to parroting Israeli propaganda. How could the Palestinians possibly provoke an armed to the tooth adversary? “President Obama’s response to the assault on Gaza was predictable. The U.S. banking/military/industrial complex (the Warmakers) signaled their unrestricted support for Obama in the months and weeks before the November 7 election. The Federal Reserve Bank announced three stages of massive, unprecedented spending programs, the last being QE-3, given to us only two weeks before the election. Chairman Bernanke pledged to print and spend another $40 billion per month for the foreseeable future to buy mortgage equity. This was the biggest ever election gift to an incumbent, sufficient to swing the close election.